This is Day 1 of the 14-Day Healthy Living Challenge where hundreds of participants around the world work together to improve on their diet and fitness in January 2015. The challenge is now over, but you can do the tasks in your own time. Visit the overview page for all tasks and posts. Over 180 Participants!! Have You Signed Up Yet??? If you’ve yet to officially sign up for the challenge, please do so first here: https://personalexcellence.co/blog/healthy-living-challenge/. As of this writing, we already have over 180 official participants! Note that signing up is compulsory to receive the daily tasks and participate in the challenge tasks. While you can’t control whether others want to join or not, you never know the difference passing the word can make. Perhaps your loved one begins to take healthy living more seriously because of what you did. Perhaps your friend finally loses that final 5 kg / 11 lbs because of the healthy habits he/she adopts from the challenge. Perhaps your colleague starts eating healthily because he/she was first inspired by you. While we can’t control what others will do, we can surely lead by example and rally others to join a positive cause. Spread the word today and invite others to join the 14-Day Healthy Living Challenge in 2015! A great health is necessary for a great life, so let’s encourage others to achieve their best health this new year! Past challenge participants probably saw this coming as this was the first task for previous runs. 😀 In fact, my very first tip in 45 Tips To Live a Healthy Life is to drink more water! Why is drinking water the first task? Because water is life. Water is essential for our body to function. 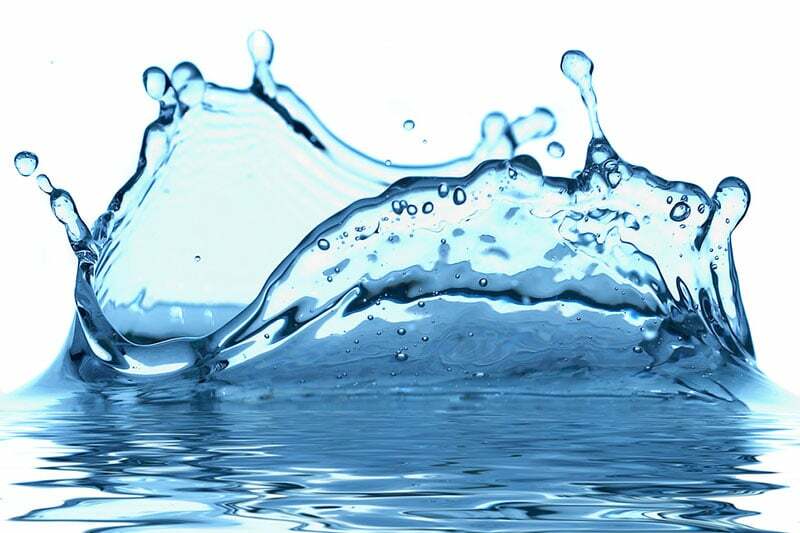 Did you know that over 60% of our body is made up of water? Water is needed to carry out our body functions, remove waste and carry nutrients and oxygen around our body. Since we lose water every day through urination, bowel movements, perspiration and breathing, we need to replenish our water intake regularly throughout the day. Not only that, drinking water aids weight loss (and this will be particularly relevant for those of you aiming to lose weight!). According to a Health.com study carried out among overweight men AND women over three months, people who drank water (specifically 16 ounces of water, the amount in a small bottle of spring water) BEFORE meals eventually lost 2 kg / 4.5 lbs MORE than the people who did not drink water before their meals. All of them consumed the same low-calorie meals pegged at 1,200 calories a day for women and 1,500 calories a day for men. Not only that, the weight loss appears to last. From the same article, “after a full year of the same regimen, the water drinkers had slimmed down by an additional 1.5 pounds, on average, while those who didn’t load up on water before meals gained about 2 pounds.” How crazy is that?! While there is no conclusive explanation for this extra weight loss, my guess is that (1) when you don’t drink sufficient water, your body retains water which then adds on to your body weight (and gives you a “puffier” look too, (2) drinking water helps you to feel fuller, hence reducing the need to eat more or to drink unhealthy sodas and calorie-heavy drinks, and (3) drinking water helps your body to remain hydrated and reduces unhealthy cravings that arises when we’re not in a high-consciousness state. Yet, many of us don’t drink enough water! Most of us (myself included at times) only drink once or twice a day (usually during meal times) and neglect our fluid intake in the other parts of the day. Guess what — if you have dry (even cracked) lips, a dry mouth/throat, and/or dark urine (and not because of medication or vitamins), you likely lack enough fluid intake. To estimate the amount of water to drink, use the calculator on this page: Human Water Requirement Calculator. While I don’t think there’s hard science behind the numbers, it provides a helpful gauge based on various factors (weight, exercise, and climate). Ultimately, this result should be used as a supporting figure, while using your body as a gauge. If your lips are dry or cracked, your mouth/throat feels dry or your urine is dark-colored (and not because of medication/vitamins), you are probably drinking insufficient water. If your lips are plump and hydrated, your mouth/throat feels hydrated and your urine is light-colored, then you probably are drinking enough water. For today, drink the amount of water from Step 1. Space out your water intake throughout the day as opposed to drinking all at one go. After all, we’re not camels; we don’t have the ability to store and distribute water when we need it! Carry a water bottle — You never know when you’re going to get thirsty! This way you can drink wherever you are. Knowing your bottle capacity will also help you keep track of how much you have drank and how much more you have to drink. Use a big mug and put it at your desk to minimize refill frequency. Have a jug/flask of water for the same reason as #2. If you have a habit of drinking insufficient water, set self-reminders in your phone/computer to drink your water. As it becomes a natural part of your routine, you can then drop the reminders. After Day 1, does it mean that you’re done drinking water and there’s no need to bother with your fluid intake anymore? What tasks have you set for Day 1 of your 14-Day Healthy Living Plan? Do them today! I encourage you to take pictures of your healthy meals — breakfast, lunch, dinner, and mid-day snacks if any — and share them in the comments section along with your progress update. 😀 After all, a picture tells a thousand words, and when you share photos of your healthy meals, it inspires others to eat healthily and gives them ideas on what healthy food they can have too! Post your initial comment sharing your results for today’s challenge task, then add on throughout the day as you have your breakfast, lunch, dinner, and/or if you’re doing any workouts. Attach photos of your meals by clicking the image icon on the bottom left of every comment box. As you add on to your comment thread, be sure to click on the reply button directly below your original comment so that you reply to your own thread (as opposed to starting a new thread). Share in the comments section! After you’re done, proceed to Day 2: Eat 5 Servings of Fruits & Vegetables!